The popular Intuit-owned Mint finance management app updated to version 4.1 today adding new bill reminder features, more accessibility support, and general improvements all around. 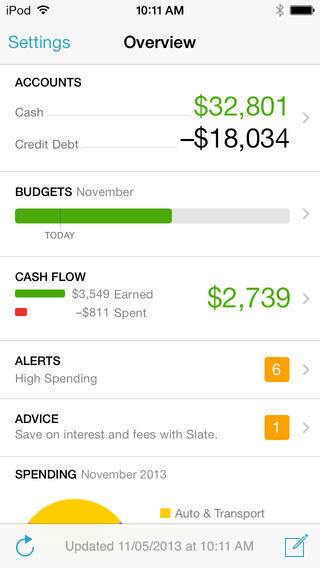 Highlighted in the new version is the ability to manage bill reminders right from the app. For the iPhone version, bill reminders can be created, edited, and managed from the latest version of the app. A change to the Overview tab wraps all this together. Mint has also enhanced the newly added Updates view to show upcoming bill due dates. The new Upcoming Bills Card will present any bills with a due date within the next seven days. In terms of accessibility, Mint has added support in a number of areas of the app. This includes the login, signup, split transactions and transaction detail pages. Mint 4.1 for iPhone and iPad is available for free on the App Store. The Mint mobile app is rarely updated with new features, but it’s not like it has been abandoned — it receives maintenance updates every few months. Today, though, Mint has pushed version 2.7 to the App Store which does bring more than just bug fixes. Apple announced on Tuesday that iOS 7 will be publicly available on September 18th. The revamped OS moves completely away from the realistic designs of the past six generations, dropping almost all “artificial shadows” (as Apple SVP Craig Federighi called them), gloss, and even button borders. Instead, the Jony Ive-inspired interface features an entirely rethought design language that focuses heavily on large icons, lightweight fonts, whitespace, transparency, and conservative use of color. We previously took a look at what some of Apple’s own in-house apps could look like when redesigned for iOS 7. During Apple’s September 10th event, Federighi flashed up a slide displaying the upcoming iOS 7 updates for many third-party applications. None of the apps were labeled, but we’ve tracked down names for most of them.